One of the most common errors homeowners make is not checking the water heater thermostat setting. It is often set higher than necessary. The thermostat on a hot water heater tank controls how hot the water within is maintained at all times. The thermostat controls how often the heating elements turn on and off so that the temperature of the water stays at the set temperature. 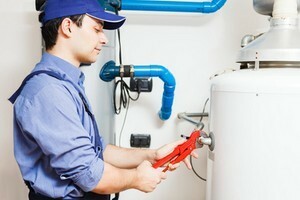 If a water heater is set to a higher temperature than needed, energy is wasted. This is because the water is overheated day and night when in reality it is only needed during certain times at lower temperatures. Most water heater manufacturers set the thermostat to 140 degrees Fahrenheit. This is often too hot for most people and will scald tender skin. The water heater panel will need to be removed to see the thermostat setting. Fours small screws hold the panel in place. Call a local licensed Tampa plumber if you need help. Commonly, a water heater thermostat setting between 125ºF to 130ºF is sufficient for most households. If your setting is at 140ºF, you can see that constantly heating the water to 140 degrees makes a difference in energy wastage. Turning down the water heater can save you as much as 6 to 10% on your utility bill. If you find that a lower temperature is not hot enough, turn it to a temperature that is comfortable for you and your family. Be sure if you are planning to turn down the temperature, that you check on your dishwasher first. Some dishwashers do not have a hot water booster (they don’t heat water) and may require a 140ºF temperature for the destruction of bacteria and optimal disinfecting. You can have mixing valves installed that will help cool off the higher temperature water when you need it for bathing or hand washing. Call a local licensed plumber for help if you need it. Besides turning down the temperature of your water heater, you can save energy by insulating your water heater tank and hot water pipes. It is not hard to insulate your tank or pipes. You will just need to wrap and tape pre-made insulation materials around the water heater and piping. Call a local licensed plumber for help if you need it. If you are located in the Tampa or surrounding areas, 1st Choice Plumbing Solutions will be glad to help. Insulating your water heater can diminish heat loss by 25-45%. This will save you around 4-9% in water heating costs. If you require the assistance of a professional Bloomingdale, FL plumber, please call 813-643-7556 or complete our online request form.